ARINC 818, the Avionics Digital Video Bus (ADVB), is a protocol based on Fibre Channel Audio Video (FC-AV) and ANSI INCITS 356-2002. A key benefit of ARINC 818 is low overhead, which allows real-time transmission of video signals at high data rates—routinely at 4.25 gigabits per second (Gb/s) as of early 2017, with prospects for three times that rate in coming months. The protocol has very low latency, which amongst other suitability, ensures that a head-up display matches a pilot’s visual input. ARINC 818 allows great flexibility. By utilizing an interface control document (ICD) to maintain interoperability among the components of a particular ARINC 818 system, the protocol is not tied to any one physical layer or video format. On fiber, video can be transported over long distances (limited to 500 meters to 10 kilometers, depending) with no electromagnetic interference. It can also be utilized on copper, including bidirectional coax. Other physical layers, such as wireless, are unproven but likely possible. 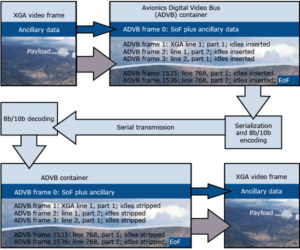 ARINC 818 converts each video frame into a transport unit called an ADVB container. Within the container are packets called ADVB frames. Because ADVB frames do not correspond one-to-one to video frames, it is important to avoid referring simply to « frames ». Reconstruction, including the stripping of idles. Eight-bit/10-bit (8b/10b) encoding allows for long-distance transport. For every 8 bits (every 1 byte) of information sent, the physical link transmits 10 bits, which adds 20 percent overhead on the physical link. For example, to transmit 32 bits (4 bytes), the 8b/10b encoding will physically transmit 40 bits over the link. The 4 bytes will be stripped back down to 32 bits once it has been received. Bytes are designated as data or special characters, such a start of frame (SoF), end of frame (EoF), and idle characters. When data is not being transmitted over the physical link, idle characters will be inserted, maintaining continuous transmission. The container consists of a header and objects known as the payload. The simple parametric digital video profile uses four objects for encapsulating the ancillary data, audio data, and video data. The payload from the whole sequence of ADVB frames is a container. A container is assembled from the payload of many ADVB frames. The payload of the first ADVB frame transmitted contains Object 0, or the container header, which includes ancillary data. The payload of the next ADVB frame contains the first lines of video data, in Object 2. The payload often contains only Object 0 and Object 2. Object 1 is for audio that usually is not used, and Object 3 is used only in the case of interlaced video frames.